Feeling stressed, bloated, tired, and just plain blah is something we all go through at some point or another. These things may be symptoms of toxic buildup in your body, and if you've been looking for a reliable way to clean your body and get your energy back, Renew Life may be able to help. Flush & Be Fit for Women is a total-body cleanse designed specifically for women to not only detox, but to re-gain their energy as well. 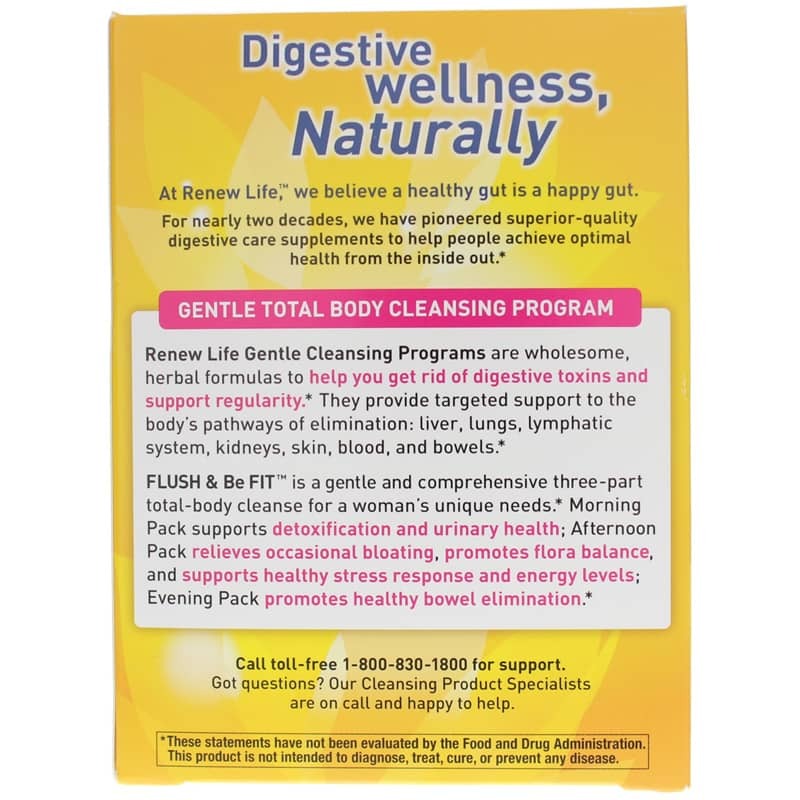 This product contains a morning flush and detox blend, an afternoon energize and balance blend, and an evening cleanse and eliminate blend--all of which help restore and maintain vibrant health and energy. And with convenient strip packs, it's easy to slip into your purse or other day bag! Each blend is made with herbal ingredients and designed to support optimal health, and they contain no GMOs, gluten, salt, fillers or binders, preservatives, or artificial ingredients. The morning pack is meant to be taken in the morning on an empty stomach, the afternoon pack should be taken in the afternoon with a healthy meal, and the evening pack is meant to be taken before you go to bed. Don't let toxin buildup keep you tired, bloated, and feeling awful. 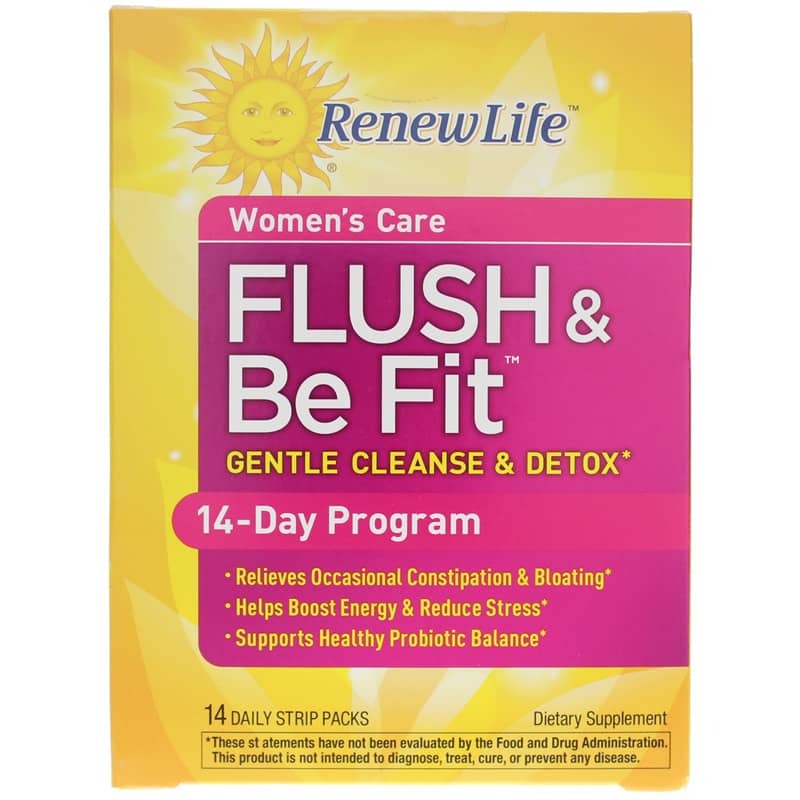 Give Flush & Be Fit for Women from Renew Life a try today, and see the difference a cleanse may be able to make for you. Order now! Contains NO: GMOs, salt, fillers, binders, preservatives and artificial ingredients. 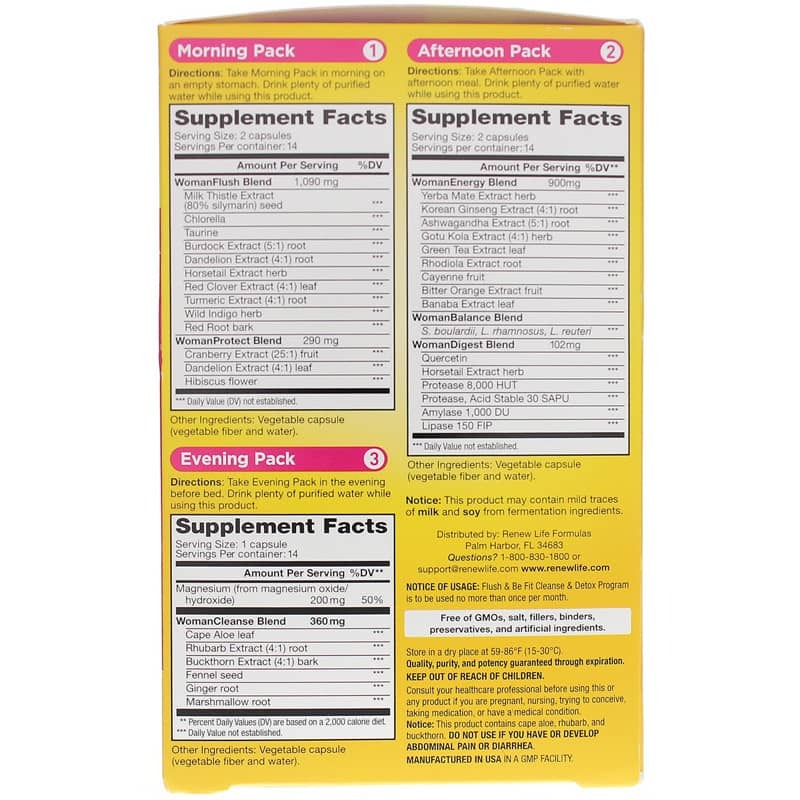 Adults: Take Morning Pack in the morning on an empty stomach. Take Afternoon Pack with afternoon meal. Take Evening Pack in the evening before bed. Drink plenty of water while using this product. Do not use this product if you are pregnant or nursing. Consult your physician before using this or any product if you are trying to conceive, taking medication or have a medical condition. Caution: This product contains low levels of caffeine (5mg per serving). Please consult your physician if you are on a caffeine-restricted diet. Notice: This product contains cape aloe, rhubarb and buckthorn. DO NOT USE IF YOU HAVE OR DEVELOP ABDOMINAL PAIN OR DIARRHEA. Please read and follow directions carefully. Keep out of the reach of children.